Israel and Russia recently marked the 25th anniversary of bilateral ties with signs that relations between the two countries were significantly improving, especially regarding the war in Syria. 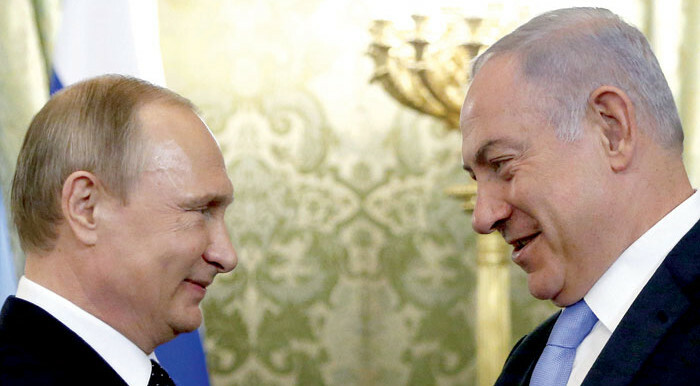 Israeli Prime Minister Binyamin Netanyahu has met with Russian President Vladimir Putin three times in the past year in addition to having at least six phone conversa­tions during the same period. Russian Prime Minister Dmitry Medvedev visited Israel in mid-November, meeting with Israeli President Reuven Rivlin and lead­er of the opposition Isaac Herzog as well as Netanyahu, who urged that Moscow and Tel Aviv “must continue our mutual fight against terror”. During the visit, Israeli Agricul­ture Minister Uri Ariel offered to give Medvedev a $50,000 drone that was on display. Ariel came un­der fire from the Israeli opposition, which noted that the drone con­tained sensitive technology that was not meant to be shared with the Russians. The move could have been a response to an earlier symbolic Russian gesture. In June, Russia returned to Israel an Israeli tank seized by Syrian troops in Lebanon in 1982. The tank, given as a gift by the Syrians to Moscow, had been on display at a museum in Russia. There are reportedly 1.5 million Israeli citizens who are originally from Russia or the former Soviet Union. Israel is also one of the most popular tourist destinations for Russians but the area that has witnessed increasing cooperation is war-torn Syria. The Israeli and the Russians es­tablished a hotline in 2015 over which they coordinate militarily to avoid accidental clashes. Although Moscow and Tel Aviv are not back­ing the same sides in the Syrian conflict, they have shown an un­derstanding towards each other’s security interests. Russia supports the regime of Syrian President Bashar Assad, which is backed by Iran and Leba­non’s Hezbollah. The Israelis fre­quently bomb Syrian military sites and weapons that it says could threaten Israel’s security if they fall into the wrong hands — with­out objection from Russia. Some analysts said that, al­though Israel may want to see the weakening of Assad, it does not want him to be overthrown. He and his father, Hafez, before him had kept Syrian borders with Israel relatively peaceful. “Israel has developed a tacit se­curity regime over the Syrian situ­ation. It is in the interest of both [Israel and Russia] to ensure that the crisis does not spill over to the Israeli-occupied Golan Heights and other neighbouring countries, as well as to prevent the spread of Islamist extremism across the re­gion,” said Asaf Siniver, Associate Professor in International Security in the Department of Political Sci­ence and International Studies at the University of Birmingham, England. Although Israel is unhappy with Russia’s support for Iran and Hez­bollah, “for now, the common de­sire to keep a lid on the Syrian crisis is enough to enable both countries to see more shared interests than differences in their regional coop­eration”, added Siniver. This could change after the de­parture of US President Barack Obama, who had a “strained re­lationship” with Netanyahu, said Siniver. “This tacit relationship (between Israel and Russia) is un­likely to be sustained over the long run and is very much dependent on regional and other external de­velopment, not least among them is what President-elect [Donald] Trump’s policies will be on these issues,” he said. Ibrahim Fraihat, international conflict resolution professor at the Doha Institute for Graduate Studies, also sees the warming of Israeli-Russian ties partly owing to Obama’s foreign policy. “Israel has no choice but to beg for Russian cooperation in Syria as Moscow emerged as the sole decision maker in Syria after the Obama Administration voluntarily chose to distance itself from the Syria chaos with the exception of fighting ISIS,” said Fraihat. Many media outlets of the Syrian regime, Iran and Hezbollah, which brand themselves as the “axis of resistance”, have portrayed Rus­sia as an ally that opposes not only American policies but also Israeli ones, including in Syria but the increased Russian-Israeli coop­eration, especially over Syria, has made it more difficult to continue with that narrative. Mahan Abedin, an analyst of Iranian politics, distinguished be­tween the view of Damascus to­wards Moscow and the view from Tehran. “The Syrians have been hosting a Russian naval base in Tartus for decades and they are for all intents and purposes a strategic ally of Russia’s. Iran does not view Russia as an ally,” said Abedin.